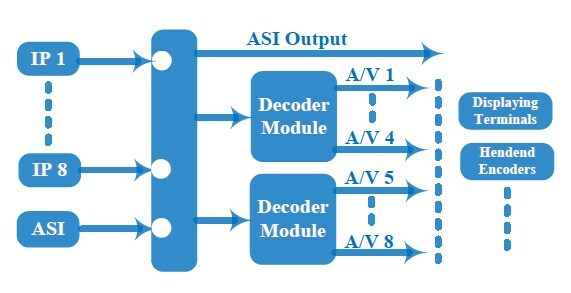 ADV-8708 - 8-Channel Video/Audio Decoder | AdvancedDigital Inc.
ADV-8708 is a professional video/audio decoder capable of advanced decoding functionality. It supports digital TS input through both IP and DVB-ASI inputs. It can receive up to 8x IP streams (MPTS/SPTS, unicast/multicast) and 1x ASI stream (MPTS/SPTS). After decoding it outputs up to 8 channels of analog A/V signals: 8x CVBS and 8 unbalanced audio stereo pairs (or 16 mono). It also features an ASI output for passing through incoming TS to other equipment.